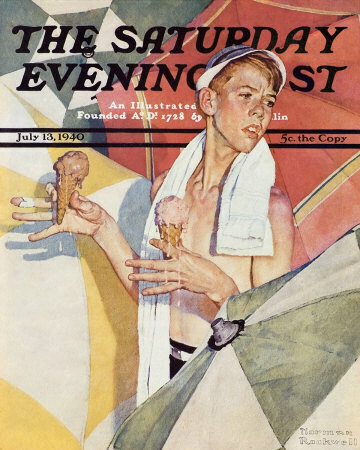 Boy With Melting Ice Cream Cones, a Norman Rockwell painting, appeared on the cover of The Saturday Evening Post published July 13, 1940. This is another favorite of Rockwell collectors, a classic enduring image of the world Rockwell painted. Alternate titles for this painting are Melting Ice Cream and Joys of Summer. This painting was Rockwell's 195th overall out of 322 total paintings that were published on the cover of the Saturday Evening Post. Rockwell's career with the Post spanned 47 years, from his first cover illustration, Boy With Baby Carriage in 1916 to his last, Portrait of John F. Kennedy, in 1963. This was also the fourth cover for The Post in 1940. In 1940, there were seven Norman Rockwell Saturday Evening Post covers published. In this classic Norman Rockwell painting, we see a boy who is lost at the beach. More than that, he has a definite time limit in which to find his girlfriend. It would be a total waste to find the umbrella she is sitting under if the two ice cream cones he has bought have already melted by the time he finds her. The waste would be his time, his money, two perfectly goo ice cream cones, his girlfriend's dismay at not getting the promised ice cream. Not to mention, his hands will be all sticky; not a good thing at the beach. Boy With Melting Ice Cream Cones was only one of 322 Norman Rockwell Saturday Evening Post covers; Here is the list of Norman Rockwell Saturday Evening Post cover illustrations. Do you think that maybe he doesn't remember what color the umbrella was? Or could it be that, in the sun's glare, he cannot make out the colors of the umbrellas? The clock is ticking, the sun is shining and the cream is melting. It's just a shame that he can't just eat them both! At least they would not be wasted. Do You Have A Great Story, Opinion Or Contribution About Boy With Melting Ice Cream Cones?